Breezy Two #113 is a lakeside two story family cabin which is the smaller of two homes on a relaxing treed lot, that can also be combined for larger groups in the great mountain setting of the Mallard Bay area. The bay-view kitchen is equipped with the essentials including basic appliances and a dishwasher, cookware and essentials, plus there is a cute dining room area with table seating for meals. 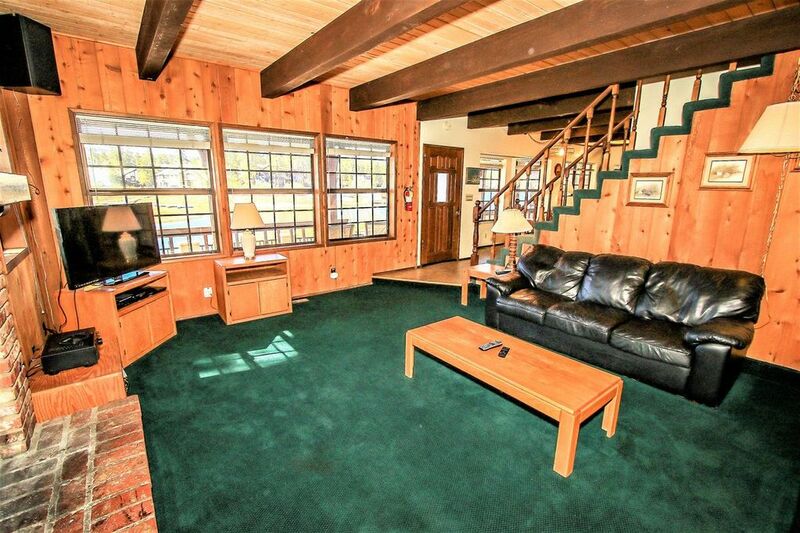 There is a lake-view sunken living room which includes comfy leather furnishings, a warm wood burning fireplace, flat screen TV, and there is a laundry area available for your use. Venturing outside, this charming property offers a big wood deck with a great patio patio area and seating overlooking the bay plus has a Charcoal BBQ and shared boat dock available for your use. Breezy Two has the essentials you will need, plus a wonderful location, yet is still within walking distance to the downtown area, or a short drive to all that Big Bear has to offer, making this cabin the perfect place to spend your next mountain getaway!